London – Wednesday, 16th April 2014 - After the incredibly successful double title fight headed ‘FAST & FURIOUS’ event last month, TRAD TKO’s head honcho Johnny Eames has wasted no time in putting together his second show of the year, ALL GUNS BLAZING, which will take place at the Troxy in Limehouse, London on Saturday 26th April 2014. 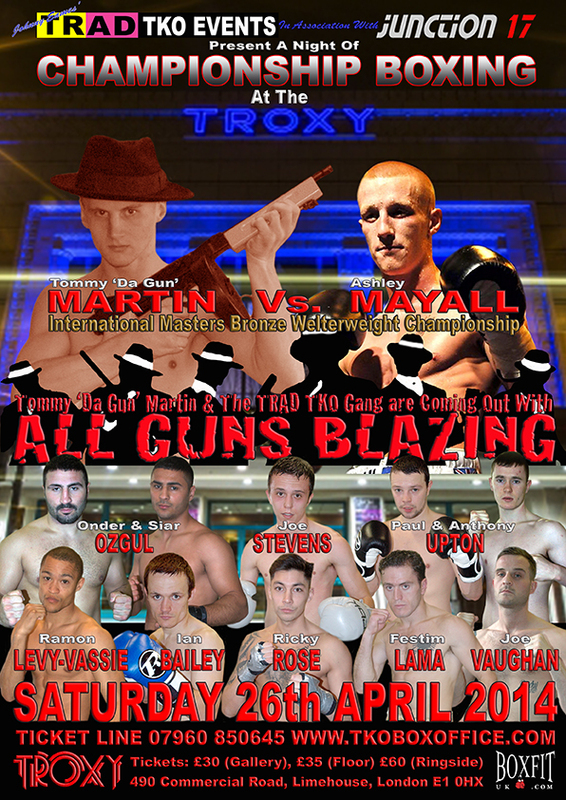 The eleven bout card, featuring a number of the esteemed Mr. Eames’ famous East End fight factory’s rising stars, will be headed up by twenty year old Tommy ‘Da Gun’ Martin, who will betaking his first tilt at a Championship, when he faces Oldham’s Ashley Mayall for the British Masters Bronze Welterweight title. On announcing the full and final line-up for the 26th April show promoter Johnny Eames said. “The Peterborough show, we did in association with our sponsors Junction 17 Cars, who are based in Peterborough, was a fantastic success, both in attendance and bouts. I want to thank Jon Pegg, who I consider to be the best Matchmaker in the Country, we tell him what we want, as near to fifty-fifty fights, and that’s what he constantly delivers, as proved as not all our boys win all the time, but they are in very close fights, they’re never outclassed and neither are the opponents in fairness. Our sponsors Junction 17 Cars were very happy with the attendance and even more than happy with the quality of the fights that night, which gave us the grounds for our upcoming show on the 26th. After his great performance against Dougie Curran last month, we’ve moved our Tommy Martin up to title level. It was a fantastic fight, a seriously close all action affair that Tommy came through with flying colours. On the 26th young Tommy gets another tough test as it will be Ashley Mayall he’ll be facing. Ashley was in a real war with our own Billy Morgan recently, so we know he is as tough as they come. Besides Tommy we have more of the TRAD TKO stable of youngsters in action, all in good fights against good fighters. We’ll have two sets of brothers again, Siar and OnderOzgul and Paul and Anthony Upton. Both sets of unbeaten brothers had top class international amateur careers and all four are proving to be as winning in the pros as they were in the amateurs. Siar and Paul will both be making their fourth outings and Onder and Anthony will be making their second pro start on the 26th. We’ve also got the exciting young debutants on the show, in Ricky Rose, who unfortunately was due to debut last month on our last show only to be disappointed when his opponent pulled out, so ended up doing an exhibition bout against our Andy Gatenby. We’ve also got Ramon Levy-Vassie making his debut, who looks to be quite a talent in the Welterweight division. Then we’ve got big ticket selling Joe Vaughan from Canning Town, up to date the kid’s done over seven grands worth of tickets, keep that up and he can fight on everyone of our shows. On a serious note I’ve known Joe since he was a little kid, he boxed for me at West Ham, he’s been well schooled, he’s a bit late turning pro at twenty nine, but he’s a dedicated kid and a really good fighter and of course as you can see he’s a big ticket seller. We’ve also got the ever present Ian Bailey, he’ll fight anyone, anywhere, anytime. We’re going to give Ian a bit of an advantage on this show, he’s normally called up with short notice and in the away corner but on 26th he’ll be in the home corner and we’ve given him time to prepare, so hopefully he’ll come away with a win. Ian comes in off the back of a great win, against a kid that was 6-0, who he stopped. Then we’ve got another of our ‘have bag will travel’ boys Festim Lama, he’s a great, great crowd pleasing fighter. Then we’ve got little Joe Stevens, who was very unlucky to lose on his pro debut, I thought, but let’s hope we can put it right next week.